Reflections on philosophy, theology and just observations on life. 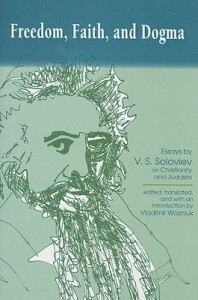 Along with Kierkegaard, Soloviev is one of my favorite Christian philosophers. This book is a collection of essays that follow the themes of the title. Some of the ideas were later disavowed by Soloviev; namely, utopianism and a church unity realizable within history. There's some things in here that are close to being almost dispensationalist -a system I find abhorrent for many reason that I won't go into in this review. Soloviev appears to believe that Judaism itself is a part of God's plan; this idea puts him in line with dispensationalism unfortunately. I do agree with Soloviev that God has a plan for the Jewish people, but my conviction is that that plan is for them to accept Jesus Christ, not that He is going to bless them with a thousand year utopia and grant them faith by sight like dispensationalists believe -which is completely contradictory in fact. His essays on fraudulent Christianity were some of the better ones in the book. I am glad I bought and read this book. It's a good addition to the books I already own and have read by him.